Whole Pakistan is paying tribute to MM Alam on his sixth death anniversary. MM Alam death anniversary is being celebrated today. 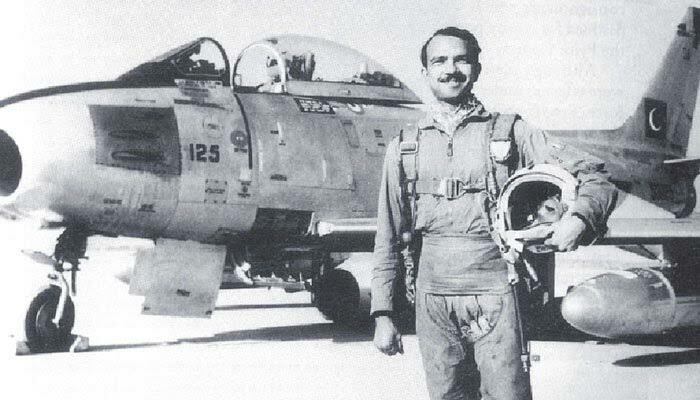 In 1965 India Pakistan War, MM Alam shot down 5 fighter jets within a minute. He encountered Indian aircrafts at 3 different points. He did a great job as in less than 60 seconds, 5 military Indian Air Force war planes were downed one after another by Alam as he hit targets flying his Seber-86 jet. In recognition of his extraordinary aerial defence show and skills, MM Alam was awarded titles like Falcon and Little Dragon. During the Indo-Pak War, he completely destroyed 11 Indian jets on different points from which 9 were completely annihilated while 2 were partially damaged. He was also awarded the 3rd highest military honor of ‘Sitara-e-Jurrat’. MM Alam died on March 17, 2013, after a prolonged illness and is buried at the Shuhda Qabiristan at PAF Base Masroor Karachi.